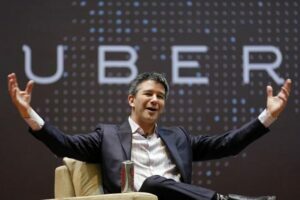 Watch: Uber CEO Loses Temper and Blasts an Uber Driver! You are at:Home»Current Events»Watch: Uber CEO Loses Temper and Blasts an Uber Driver! NOTE: The conversation with Uber CEO Travis Kalanick and driver begins at the 3:50 mark in the video. Uber is not flying as high lately as you may think. It seems more and more people are having issues with the company. In this video Uber CEO and founder Travis Kalanick is questioned by the very person who was driving him about Uber pricing and that the driver lost a lot of money working for Uber. Some are criticizing Uber as just being known as a ‘cheap ride’ and ignoring the needs of their drivers and are not paying attention to the ‘customer experience’. Uber does not allow customers to tip and some drivers are claiming they make less than minimum wage after expenses working for the ride share company. Are you an Uber driver? Let us know your thoughts. Featured image of Uber CEO Travis Kalanick speaking to students last year at the Indian Institute of Technology (IIT) campus in Mumbai. Photo by Reuters.